28. C. PRIDIE KAL. MARTII. 28. SIOLLAN, Master, Abbot of Bennchair-Uladh, and successor of Comghall, A.D. 606. Sillan was born, probably a little before or about the middle of the sixth century, but the place does not appear to be known. It is said, he became a disciple to St. Comgall, the first Abbot of Bangor. Sillan was distinguished for his virtues and learning. On account of his erudition and proficiency in scriptural knowledge, he was chosen as professor and rector, over the monastic school. Hence, he enjoyed the title of Magister, or Master. 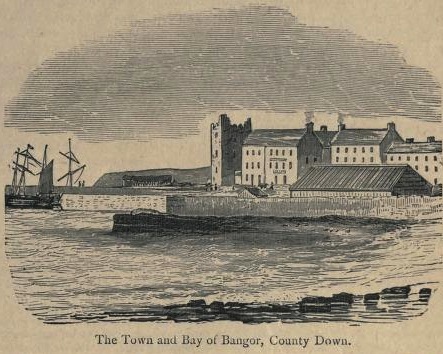 Beogna, who was Abbot of Bangor, died on the 22nd day of August, A.D. 605. In the Annals of Inisfallen, however, the rest of Beoguini is recorded, 601. St. Siollan was elevated, in succession, to the dignity of Abbot, as the third superior, over this renowned monastery. In the year 609, the burning of the monastery of Bennchoir, in Ulad, is recorded, in the Annals of Inisfallen; but, this happened, most probably, after the time of Sillan. This saint did not long survive his predecessor, in ruling over the monastery for, in about half a year after Beogna's death, according to our "Annals of the Four Masters," Sillan was called to bliss, after having faithfully discharged the duties of his stewardship, in this life. According to the Annals of Inisfallen, at A.D. 604, the death of a Sillain—probably intended for this saint—is placed. He departed on the 28th day of February, in the year 606, according to the Annals of the Four Masters. Again, the same day, but the year 609 is set down, in the Annals of Ulster, for his demise. The Annals of Clonmacnoise have the same date. The Annals of Tighernach have his death, at A.D. 610. The Irish Martyrologists place the festival of St. Sillan, at this day. Thus we find, in his Festilogy, St. Oengus has an early notice of this holy superior. His name is inserted as Sillan, Abbot, Banchoir, in the Martyrology of Tallagh, at the same date. The Calendar of Cashel, and Marianus O'Gorman, at this day, commemorate him, as the Abbot of Bennchor and the comorban or successor of St. Comgall. He is noted as a Confessor, in the ancient Martyrology of the Cathedral Church of the Holy Trinity, Dublin, where his feast is inserted at the ii. of the Kalends of March—corresponding with the 28th of February. Again, in the Martyrology of Donegal, we find mentioned, as having a festival on this day, Siollan, Master, Abbot of Bennchair-Uladh, and successor of Comghall. In Scotland, likewise, this distinguished superior received his share of honour. The holy Abbot, Sillan, departed to Christ in Ireland, on the ii. of the March Kalends, or on the 28th of February, according to the Drummond Kalendar. His personal sanctity gained him the admiration and love of all his community; while his repute for learning has survived, although its manifestation may not now exist, in the shape of works attributed to him. A famous teacher of the world. That St. Comgan was connected with Gleann-Ussen appears, from the authority of the Menelogium Genealogicum, the Martyrologies of Tallagh, of Cashel and of Marianus O'Gorman. This was the name of a remarkable glen, situated in the territory of Hi-Bairche, about two Irish miles to the west of Carlow. 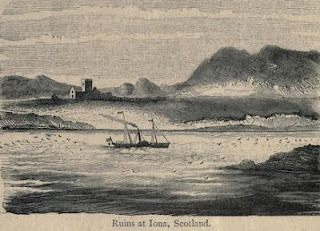 There exists a considerable portion of the ruins of an ancient church, called Cill Ussin, anglice Killeshin. 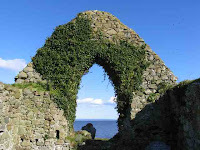 At Killeshin, St. Diarmaid or Diermit is said to have built or presided over a church or monastery; and, this must have been as late as the ninth century, if we are to identify him with that Diarmaid, Abbot of Gleann-Uissean, whose death is recorded at A.D. 874. Now, Comgan is generally allowed to have succeeded him ; but, at what particular date is not clearly ascertainable, for we cannot find any well-known allusion to him in our Annals. We find him placed after St. Diarmaid, in the government of Killeshin Monastery, and he cannot have enjoyed this position, before the close of the ninth century. Probably this was about the time, when our St. Comgan was abbot over that establishment. 27. B. TERTIO KAL. MARTII. 27. COMDHAN, [i.e., Diarmaid,] of Glenn-Uissen, son of Diarmaid, son of Deghadh, of the race of Cormac Cas, son of Oilill Oluim ; and Ethne, daughter of Feidhlimidh, son of Tighernach, was his mother. The Kalendar of Cashel, the Martyrology of Marianus O'Gorman, and the Martyrology of Cathal Maguire, have entered his festival, at the 27th of February. This holy man appears to have been greatly venerated, in Ireland, where his Office, containing nine Lessons, was formerly recited. At the iii. of the March Kalends, or at the 27th of February, we learn from the Kalendar of Drummond, that in the Island of Hibernia, the Natalis of the holy Confessor Comgan, who went to Christ, was celebrated. No further biographical statements, in reference to him, have been preserved. Various denominational forms have been applied to this saint, and it has been conjectured, that he was originally called Ena, Enna, or Ennius. Thence it was probably resolved into Mo-Ena, Mo-Enna, or Mo-Ennius. He has also been called Moenus and Mainus. Among the old Irish oe and ai had a like sound, and Mo is merely a prefix, which indicates some special affection. This saint is also called Moinne, Moune, Muinni, or Moen. He is said to have been a Briton, who accompanied St. Brendan of Clonfert, on his return to Ireland, after that celebrated seven years navigation of the ocean, during which he visited the great Western Island, or Continent, and after he had lived some time in Armoric Britain. In the Island of Inis-mac-Hy Chuinn, both master and disciple are said to have dwelt. Whether or not, Moena had been elevated to the episcopal dignity, before leaving the country of his birth, may be questioned ; but, when seventy-seven years old, St. Brendan is said to have founded Clonfert. St. Moen lived with him, and during his sojourn there, a certain youth, who had come with his parents, died. Three days after this occurrence, and when the body was quite rigid, St. Brendan said to Bishop Moena, "Place my staff on the body of the dead brother." Obeying this command, the youth came to life, and thus miraculously preserved, that brother, confirmed in the faith, was sent home to his native country in Britain. Colgan makes St. Brendan the founder and first Bishop of Clonfert, about the year 553, and he says, that St. 'Brendan abdicated, having placed St. Moena in his room'. Other writers make St. Moena the first bishop, over this see. A great pestilence, called in the Irish language, Samthrusc, Samthrose, or Sawthrusc, prevailed, in the year 551 or 553, according to various Irish Annals, and it is generally resolved into a Lepra or Leprosy. It might have been that disease, which carried off the youth already mentioned. It is very probable, that our St. Enna or Moen was Bishop of Clonfert. Yet, a difficulty occurs, from his festival having been marked, not at the 1st of March, but at the 26th of February. In the "Annals of the Four Masters," in the third year of Aedh, Monarch of Ireland, we find the death of St. Maeineann, Bishop of Cluain-fearta-Breanainn, recorded at A.D. 570, and it is said to have occurred, on the 1st of March. We find, in the Ulster Annals, under A.D. 571, the death of the first bishop of Clonfert thus remarked, ' Moena, Bishop Clonfert-Brenain, went to rest." St. Brendan, it is stated, was then alive,and this agrees with most of our Annalistic accounts. The Annals of Tighernach state, at A.D. 572, that Maenu, Bishop of Cluanfert Brendan rested. The day of Moena's death is placed, on the 1st of March. Under the form of Monan, Bishop Forbes assigns him a festival, at the latter date, or at the 26th of February; while, at the same time, a doubt of his identity is properly expressed. In the Martyrology of Tallagh, we find St. Moenna venerated, on the 26th of February. A Manuscript Antiphonarium, classed B. i, 4., belonging to Trinity College, Dublin, at this day, Kal. iiii. Martii, notes him as a Bishop and Confessor, in the Calendar, with an Office of Nine Lessons. In the Martyrology of Donegal, Maonna occurs, at the same date. In that Calendar, prefixed to the Martyrology of Christ Church, Dublin, this holy man is commemorated as a bishop. His feast was celebrated with an Office, consisting of Nine Lessons, as we are there likewise informed. Attempts have been made, to shew that the cultus of this saint had extended to different parts of Ireland. A St. Moenna is venerated in Jesu-Mond, diocese of Ossory, on the 26th of February. This concurrence would seem to make the present saint its patron. St. Aldetrude, or Aldetrudis, Virgin and Abbess of Malbod, or Maubeuge, Belgium. This holy virgin is claimed as belonging to the Saints of Ireland, by Father John Colgan, who inserts her Acts at the 25th of February, because on the father's side, her ancestral blood was Irish, even although she was born in Belgium, and lived there. The Bollandists, after a Scholiast introduction, produce a brief Latin Life of the saint, adding some few notes, by way of elucidation. These Acts are made up from a Manuscript Codex of St. Aldetrude's Life, found in the Monastery of Rubra Vallis, near Bruxelles, and inserted in the first part of the Brabantine Hagiology; and again, from Lessons of the Breviary, for the collegiate church of Mons, founded by St. Waldetrude. The father of St. Aldetrude was Maelceadar or Maldegarius, also called Vincent, the latter name having been received on account of numerous victories he obtained, and for this reason, too, he was created Count of Hainault, in the Low Countries, by Dagobert, the renowned King of the Franks. 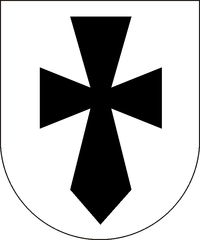 This latter monarch to increase those honours gave his relative St. Waldetrude, or Waldetrudis, in marriage. Their alliance was the happy occasion, for giving at a future time four holy children to the Church, viz. : St. Landric, Bishop of Meaux; St. Dentelinus, Patron of Rosensis, in Cleves; St. Aldetrude and St. Madelberta. The sister of St. Waldetrude, called St. Aldegunde, had founded a religious establishment at Maubeuge, a town in French Flanders, and near the southern border line of Belgium. From her earliest infancy, St. Aldetrude, with her sister, St. Maldeberta, was distinguished for her pious dispositions; and both were placed under the charge of their holy aunt Aldegunde, to receive a secular and a religious training. The influence and precepts of this holy woman soon brought her nieces to despise the vanities of this world, and to resolve on dedicating their virgin souls to Christ. Our saint especially loved to hear the Gospel sentences, relating to the wise and foolish virgins, she engaged in fervent and constant prayer, in continual vigils, in abundant alms-givings. One interesting anecdote is related. Being resolved, that the wax used in the altar candles should not go to waste, Aldetrude gathered the scrapings, drippings, and fragments of tapers to put them again into the pot. When placed on the fire, however, and when the wax melted, it caught fire. Thinking there was danger from the blaze, and not wishing to lose the wax, Aldetrude boldly seized the pot, and lifted it in her hands from the fire, to the stone floor. Although some of the melted wax ran over her hands and arms, she miraculously escaped without any burn or hurt, as a consequence of this brave adventure. This gave great edification to all the servants of the convent, who were present. Several sisters in her nunnery had remarkable visions, confirming the sanctity of Aldetrude. One of these visions showed a star descending and ascending, as if inviting the nuns to the marriage feast of their heavenly bridegroom. When her holy aunt, Aldegunde, was summoned from earth to heaven, our saint was appointed to succeed her, in the administration of conventual affairs, at Maubeuge. Over this community she presided most religiously, for a term of twelve years. During this period, St. Aldetrude ruled her nuns with great care and charity. One of her spiritual daughters, when the offices for the day had ended, and when all had retired to rest, enjoyed a vision of the Apostle St. Peter and of St. Aldetrude. They seemed to stand, at the corner of the altar, and engaged in conversation. With a benignant smile, the Apostle was heard to exclaim: "Have courage, amiable virgin, for I shall have thee and thy servants under my constant guardianship, and I shall bring to naught the efforts of the old enemy." Again looking, the nun saw a honey-comb on the lips of her Abbess, and a ladder was near, by which she endeavoured to ascend towards heaven. The relation of this vision gave great comfort to Aldetrude's religious community. Another nun heard one Sunday night the sound. of men's voices speaking to the Abbess, whose hand she held in the courtyard of the nunnery. Yet could she see no person. But venturing to ask her superioress, what she had learned, the latter said, "I heard them say : because thou art a queen, thou shalt be wedded to an eternal king." Aldetrude then fell upon her knees, and in joy struck her breast devoutly, saying, "Lord, how can this be, since I am an unworthy sinner?" Another time, eagles were seen flying towards heaven and bearing thither, as it were, St. Aldetrude and her prayers. Yet, she had some doubts regarding their efficacy, and respecting her own merits ; but, she was re-assured in a nocturnal vision, when she saw a large and a bright crystal globe fly before her and towards the East. A few days, afterwards, a holy priest told her, that on the night of the Epiphany, he beheld a venerable long-haired man, coming as an Eastern King, with three wands, bearing flowers, in his hand. These he presented to Aldetrude, saying, "Thou shalt rule them with a wand, and they shall grow in her hand to the clouds." The holy Abbess fell on her knees, and prayed with tears to God. Again, being in the open space, before the doors of her church, and alone, looking towards the south, she was dazzled with the most vivid flashes of lightning, while a tremendous roar of thunder was heard. This terrified her so much, that she cried out, "Lord Jesus, into thy hands, I commend my spirit." Suddenly, our Lord Jesus Christ himself, in the shape of a most comely young man, passed by, and said, "Be not afraid, I will guard you." This gave her great confidence and courage. One of St. Aldetrude's religious sisters related to St. Dado or Audoen, the bishop, a full account regarding the Life of her Abbess, not doubting but they should have an account of it for Maubeuge Nunnery, as the Abbot Sobnias, or Sobinus, had written a Life of her aunt, St. Aldegunde, for the Monastery of Nivelles. St. Aldetrude departed to bliss, on the 25th of February; and, the year of her death is said to have been A.D. 676, although the Bollandists seem to think, that she survived St. Audeon. But this is by no means certain. 24. F. SEXTO KAL. MARTII. 24. On the death of the Abbot, St. Suibhne, A.D. 657, St. Cuimine Ailbhe immediately succeeded him. The present saint visited Ireland, in the year 661, according to the Annalist Tighernach. The holy subject of this memoir was a man of great erudition, it is observed, and he adorned either Scotia with his gifts. St. Cumine Ailbe departed this life, as is generally thought, on the 24th of February. The Annals of Clonmacnoise, it has been stated, place his death at the year 605, but 665 must have been intended, as the true entry. The Ulster Annals and those of the Four Masters, assign it to A.D. 668. According to the Annals of Tighernach, it happened A.D. 669. All the Irish Calendars, quoted by Colgan, agree in marking the 24th of February as the day of his death. The entry, 'Cuimin find mac Fiachna mic Feradaigh, Abb. Iae', is found in the Martyrology of Tallagh, at the same date. In the Martyrologies of St. Oengus, of Marianus O'Gorman, of Charles Maguire, and of Donegal, is recorded, on this day, the festival of Cuimmein Fionn, son of Ernan, son to Fiachna, Abbot of Ia Choluim Chille. Besides these notices, at the vii. of the March Kalends, which is the 24th of February, the Kalendar of Drummond states, that the Abbot Cummain, in Ireland, went to Christ. In Scotland this holy abbot was highly venerated. Thus, in the Dunkeld Litany, he is invoked as Cumminach. Note: I have posted a translation of the Life of Saint Colum Cille by Saint Cuimine in two parts here and here. Colgan identifies this saint as a nephew of the great Saint Columcille whose third sister, Sinecha, was mother to Saint Cruimther Connrach. Indeed, she was mother to a number of holy men, one of her sons, Aidan, was a monk, another was Cucuimne, Abbot of Iona, while the other was our saint, Conrius Mocukein. Colgan believed that Saint Cruimther/Conrius was also a disciple of his famous uncle at the Columban monastery of Durrow. 22. D. OCTAVO KAL. MARTII. 22. Maelbrighde, son of Dornan, successor of Patrick and of Colum Cille ; a man full of the grace of God, and a vessel of the wisdom and knowledge of his time. He was of the race of Conall Gulban, son of Niall. Saerlaith, daughter of Coulebaith, son of Baothghel, was his mother. A.D. 925. This distinguished saint was son to Tornan, who was descended lineally, and the twelfth in generation, from Conall Gulban. He was thus of the same royal stock as St. Columkille himself. The mother of Moel-Brigid was Soerlathia, daughter to Culebaith, and she was also of noble birth. The name given to him signifies "the servant of Brigid," or " the tonsured of Brigid," or " the consecrated to Brigid," or " the Brigidian." Our saint soon became greatly distinguished, for his virtues and learning. In consequence of an opinion entertained, respecting his varied merits and accomplishments,he was appointed comorban or successor of St. Adamnan, most probably as Abbot over Raphoe. He was elevated, also, to abbatial dignity —probably at a later period— over the church of St. Columba, at Derry, according to Colgan. ...After enjoying those dignities, our saint was elevated to the Primatial See of Armagh. On account of his great zeal for religion, and the exercise of eminent wisdom and virtue, he obtained a name and repute for being, " Head of Religion in Ireland, and of the greater part of Europe." There is a difference of opinion, among our Irish Annalists and modern writers, regarding the order of succession, in Armagh See, as, also, with regard to the names of its incumbents. Maelcoba Mac Crunnvail, Abbot of Armagh, is said to have died, at an advanced age, A.D. 885, or 887. It is thought our saint, as his immediate successor, then promoted to the coarbship. 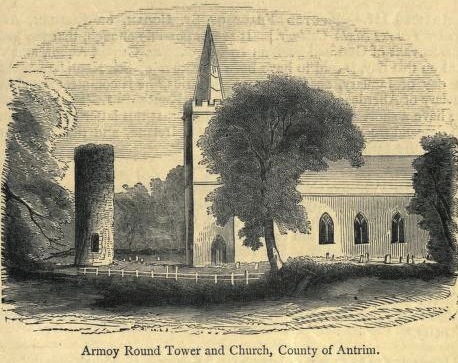 During the time of this Archbishop's administration, a great riot took place in Armagh Cathedral Church, between the Hy Nialls of Kinel-Eogain or Tyrone, and the people of Ulidia or East Ulster. Flaithbheartach, son to Murehadh, was chief over the former faction, and Atteidh, son to Luighne, chieftains over the latter. This riot, which occurred, about Whitsuntide, in the year 889, was appeased by the Archbishop's influence and exertions. This prelate induced both parties to abstain from violence, and to make due reparation to Almighty God, whom they offended, and to atone for the violation of St. Patrick's law. He is said to have been a man remarkable for his inflexible justice. From the Ulidians, Moel-Brigid obtained hostages and an offering of thirty times seven cumhals to the church; while, four Ulidians, the chief instigators of this riot, after being proved guilty were hung. In like manner, the Kinel Eogain rioters repaired those outrages committed by them, and as many more of these were hung. 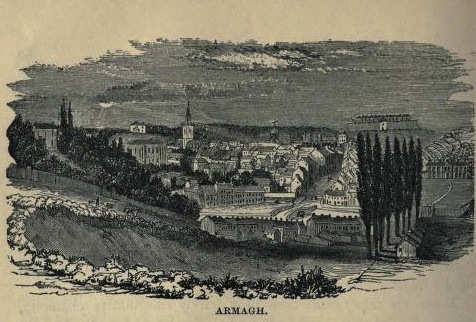 An act of violence is recorded, as having taken place in Armagh, during this Archbishop's administration. In the year 907, the privileges of the Cathedral of Armagh were violated by Kernach Mac-Dulgen, by dragging a captive out of the church, who had taken sanctuary there, and by drowning him in Loch-Kirr, west of the city. But, this violation was retaliated on Kernach, by Neall Glundub, then King of Ulster, and afterwards of Ireland, who drowned him in the same lough. Several serious disasters and disturbances occurred in Armagh, during the term of our saint's incumbency. We read, that the Archbishop took a journey towards Munster, a.d. 908, to procure the liberation of a strange Briton, who being a pilgrim in the country, had been unjustly detained there as a captive. Respecting the result of Moel-Brigid's mission, we are not informed. While he sat in this See, Armagh was three times taken and plundered by the Danes, namely, in 890, 893, and 919; and, it was once set on fire in the year 914. According to the most reliable accounts, Moel-Brigid ruled over Armagh Metropolitan See for a duration of forty years; so yet, the Calendar of Cashel gives him only twenty-nine years of rule. He departed this life, at a good old age, on the 22nd of February. To the death of Maelbrighde in evil hour. (?) of Verulus (and) Jucundus. 21. Finntan Corach i.e. on his pilgrimage he went into Connaught, and they took pledges from him to come again, alive or dead. And in Lemchoill in Tir lia nDuach and Laigis is Finntan Corach: or in Cluain Aitchen in Laigis, or in Brenainn's Clonfert he is. i.e. Coir 'choruses' are sung at his grave, and not praise. Corach, i.e. a pledge whether alive or dead to come back again. Or the shrine wherein were his relics made turns of it (?). Or 'tis he that made adjustments (cora) in the order of the new rite, ut Sancti etc. Vel quod uerius, in Cluain eidnech are the four Finntans. Finntan Corach, Senach the rough, friendly Colman son of Comgall, a trio of them with valorous warfare, one after the other in the abbacy. "Fifteen years and six score (was) the age of Finntan, a-chanting lasting melodious psalms over the brink of a fountain." "Finntani Coraighi Illeamchoill vel Cluaineidneach," i.e., the Feast of Fintan Corach of Lowhill, or of Clonenagh. 21. C. NONO KAL. MARTII. 21. Although ruling over many churches and monasteries, according to our native Martyrologists, this saint has not been distinguished, in any biographies or Acts, whereby some doubts regarding him could more easily be dissipated. 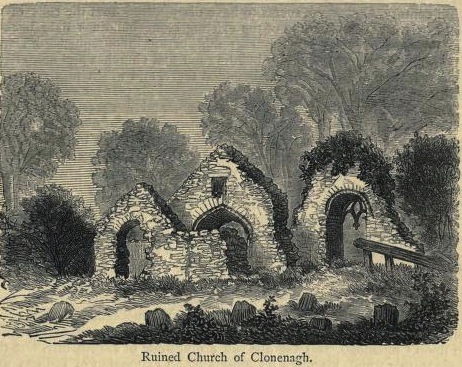 Colgan has an unsatisfactory account, at the 21st of February [where] it is said, that he presided over Leamchuill church, within the boundaries of Kilkenny County. Fintan was either buried, or venerated, at this place, as some of our Martyrologists relate. We next find it mentioned, that he presided over Clonenagh Monastery; yet, it is difficult to reconcile this statement with subsequent accounts regarding him. It has been asserted, that our saint flourished, towards the close of the sixth century. However, as this holy man cannot be confounded with Fintan Maeldubh, who, being successor to the great St. Fintan, died in the year 625, nor with that other St. Fintan Munnu, who again succeeded, and who died in 634. Dr. Lanigan suggests, that a chronological difficulty might be avoided, by supposing our saint to have been a simple monk, living at Clonenagh. Some authorities state, that he either founded or governed a church at Cluain-aithchen, or Clonkeen, in Leix. A very probable conjecture has been hazarded, that this latter place may have been mistaken for Clonenagh ; and, if such be the case, a difficulty which arises by placing him at Clonenagh, might disappear. Colgan gives us to understand, that having abandoned Ciuain-aithchin, according to a promise made, he returned to Clonenagh Monastery, or, at least, that he was buried, at this latter place. It is said, that our saint discharged the double office of Abbot and Bishop, over the monastery and see of Clonfert. Our Fintan became bishop, it has been supposed, after the death of Moenninnius. Nevertheless, Dr. Lanigan does not assert, that our saint was his immediate successor. According to the same authority, he followed St. Brendan, as Abbot ; and, our saint was afterwards succeeded at Clonfert, by the Abbots, Colman, the son of Comgall, and by Senach Garbh. The exact date of his death is not known ; but, it is a conjecture of Colgan, that he flourished, about the end of the sixth century. Our Martyrologists place his festival, at the 21st of February; thus, St. Oengus the Culdee in his "Feilire," the Martyrology of Tallagh, the Martyrology of Donegal, Duald Mac Firbis, enter Fintann Corach. In the ancient Martyrology of the Cathedral Church of the Holy Trinity, Dublin, the festival of St. Fintan, Confessor, occurs, at the ix. of the Kalends of March— 21st of February—although it is not in the prefixed Calendar. Even, in Scotland, he was reverenced. Thus, at the ix. of the March Kalends— which is the 21st of February—the Kalendar of Drummond relates, that the Natalis of St. Fintan was celebrated on this day, in Ireland. A considerable share of doubt appears to have existed among writers, respecting the place of his death and sepulture. Leamchuill, now Loughill, or Lowhill, Cluain-aithchin, Clonenagh and Clonfert or Clonfert Brendain are severally named by our Martyrologists, in connection with the anouncement of his festival, or of his departure, or of the place where his remains had been deposited. It may be supposed that our saint died towards the close of the sixth, or during some earlier part of the seventh, century: his immediate successor, in the Monastery of Clonfert, having departed this life in the year 620. We have another saint known to us from Patrician hagiography commemorated on February 20, Olcan, Bishop of Armoy in County Antrim. The Irish word olc means bad or evil, as in the concluding line of the Pater Noster ach saor sinn o olc, 'but deliver us from evil'. The hagiographers thus made an attempt to explain our saint's unusual name and the extraordinary story of his birth is only one of the strange stories associated with Saint Olcan. The account below has been taken from the writing of the Archbishop of Tuam, Dr John Healy. Then Patrick went (from the Bann) into Dal-Araide, and him Doro, King of Carn Setnai, in the North. He heard the crying of the infant out of the earth. The carn is broken up, the grave is opened. A smell of wine comes round them out of the grave. They see the live son with the dead mother, a woman who had died of ague. She was taken by them oversea to Ireland, and after her death brought forth the infant, who lived, they say,- seven days in the carn. "Olc (bad) is that," said the King (Doro). "Let Olcan be his name," said the Druid. Patrick baptised him. He is Bishop Olcan, of Patrick's household in Airthir Maige, a noble city of the Dal Riatai. IV.—Patrick and Olcan of Armoy. ...Another interesting question is— When did Olcan become Bishop of Armoy? Patrick baptised him—that we know for certain, and we may safely say he did so about the year 443, when he first came into Dalriada. We are also told that Olcan belonged to Patrick's household; so we may fairly assume that he was educated by the Saint, and prepared for his episcopal duties under his guidance. Usher thinks he was not consecrated Bishop until some thirty years later, about 474, when Patrick himself had been long established in Armagh; and perhaps this is the safest opinion. But the Tripartite speaks of his baptism and episcopacy in the same context, as if he became bishop very shortly after his baptism. In certain cases, as, for instance, St. Fiacc's, such was the fact; but we can hardly assume it as probable in the case of St. Olcan. Our opinion is he became Bishop before St. Patrick finally left Dalaradia. By anticipation, no doubt, another singular fact is related regarding Olcan. Saran was, as we have seen. Prince of Dalaradia when St. Patrick crossed the Bann. He was very justly excommunicated by Patrick, not only because he refused him the site of a church, but also because he drove him and his followers with contumely out of his territory. In that state of excommunication Saran must have lived for several years. Saran was a decided anti-clerical of the worst type, so thereupon, the affrighted bishop ' promised heaven to Saran,' or, in other words, released him from Patrick's terrible excommunication, and, no doubt, got off his own followers, as well as the captives, scot free from the vengeance of the fierce warrior. The Life and Writings of St. Patrick by the Most Rev. Dr. Healy, Archbishop of Tuam (Dublin, 1905), 329-334. St. Odran or Odhran, of Disert-Odhrain, in Offaly, Martyr. The Martyrologies of Tallagh, of Marianus O'Gorman, and of Donegal record on this day, Odran or Odhran, of Tir-aonaigh or of Tiri-oenaigh. From all we can learn, he became devotedly attached to the Irish Apostle, and he was a constant personal attendant on his missionary travels. Odran became a servant to St. Patrick, whom he served in the capacity of charioteer. We have no express mention of him, except incidentally, in different Lives of St. Patrick. From such sources, Colgan has compiled his eulogistic biography, adding notes to it. The Bollandist writers have inserted Acts of St. Odran, Martyr, in six paragraphs, at this day. This humble and devoted charioteer is classed among the disciples of the Irish Apostle. On St. Patrick's return from Munster, about the year 451, in Colgan's opinion, and after, or during the year 456, according to Ussher, the Irish Apostle entered Hy-Failge territory. 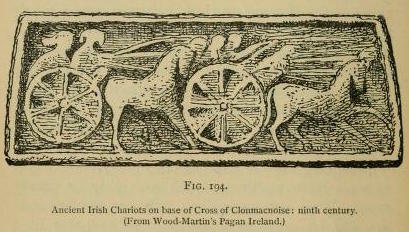 Here were two powerful chieftains ruling at the time: one was a wicked Pagan, Failge Berraide, who entertained a implacable hatred against St. Patrick, because he had destroyed the idol, known as Crom Cruach, an object of adoration among the Gentile Irish, while the other chief was named Failge Ros, who had conceived a great love and reverence towards the holy man. As the former had frequently boasted, that he would take the Apostle's life away, whenever the opportunity might be afforded; the present stage of his journeying, which brought him along the highway, not far from Failge Berraide's Castle, seemed favourable for this son of Belial's purpose. That district, since so well known as Offaly, at least in this part, was then ruled over by the merciless pagan, Failge Berraide. This wicked man's design was basely to take away by assassination the life of our great Irish Apostle; and, in the accomplishment of such a purpose, he resolved on arresting the progress of the Christian Religion, by effecting the destruction of its greatest promoter. However, Providence frustrated his purpose, although it does not seem, that St. Patrick had any suspicion of the threatened danger. Yet, his charioteer, Odhran, had some prevision of the consequences likely to ensue. 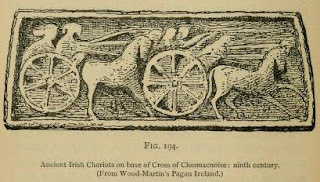 In most accounts, it is said, that having had previous intimation of this design, Odran concealed his knowledge concerning it from St. Patrick, whom he induced to occupy the driver's seat in the chariot, whilst Odran himself should have some short time for rest. The holy Apostle most readily assented. He unsuspectingly relinquished his place, and assumed the reins, in order to gratify his servant's wish. They had passed from Birr, and were travelling along an ancient road, which bore in an eastern direction, north of the Slieve Bloom mountains, where their enemy lay in wait. Failge met the travellers on their journey. Rushing against Odran, whom he mistook for St. Patrick, the furious chief transfixed him, with a stroke of his lance. Horrified at the sight thus presented, the Apostle was about to pronounce a malediction on the murderer, when the dying Odran prayed it should rather descend on a very high tree, that grew on an adjoining hill, called Brig-damh. Yet, for his Satanic perfidy, the murderer was struck dead immediately afterwards; and as a just punishment for his grievous crime, his soul was buried in hell, while angels were seen bearing that of Odhran to heaven, where he joined the array of purple-robed martyrs. St. Patrick furthermore announced, that the posterity of that wicked Foilge should wane, and lose power, in the principality; while, Foilge Ros and his posterity should rule therein, which prediction was fulfilled. In an old Biburgensian Manuscript Life of St. Patrick, we are told, that when the soul of Foilge, for his wickedness, had been carried away to hell, the devil took possession of his living body, and dwelt in it, until St.Patrick came to the house of that cruel chief. It is stated, the Irish Apostle asked one of the servants for his master, and that he was told Foilge was within. "Call him to me," said Patrick. But, the servant returned, and told the Apostle in great sorrow, that he only found the dry bones of his master. Then said Patrick :"From the time, when Foilge butchered my charioteer before me, he was buried in hell, but the devil came to possess his body, so that while his soul was consigned to perdition, his body was also dishonoured by demoniac influences." Attempts have been made to identify the place, where this martyrdom occurred. Afterwards, it received the name, Desart-Odran of Hy-Failge;... on the road, between Frankfort and Roscrea, is the little village of Killyon; and about two miles from the latter village, is yet shown the place, where Foilge attempted the life of St. Patrick. Odran's name occurs, in some foreign Martyrologies; yet, his festival has been assigned to distinct days, from the present date. Thus, the 8th of May, the 27th of September, as also the 2nd and the 27th of October have been conjecturally mentioned, in connexion with it, by various Martyrologists. About, or soon after, the middle of the fifth century, this martyrdom of Odran is considered to have occurred. This saint is honoured as a martyr, chiefly on the 19th of February; but, in certain places, as we are informed, on the 27th of October. Some churches were formerly dedicated to him, in the country about Birr, and in the Ormonds...It is probable, that many of those circumstances related, as connected with St. Odran's death, are unreliable; although, we take it for granted, that this saint must have lost his life, for his attachment to the Christian faith, and while faithfully serving his illustrious master. THERE are no less than one hundred and thirty saints, named Colman, enumerated in our Irish Martyrologies and Histories. It is not wonderful, therefore, that much confusion must exist, in distinguishing their festivals and natal days. The task of individual identification must be difficult, especially as only the simple name occurs, in many instances. At the 18th of February, Colgan notices a Bishop Colman. This saint is venerated at Ard-bo near Lough nEathach, in the county of Tyrone. Little, however, is known with certainty regarding his parentage, birth-place, the age in which he flourished, or even his Acts. It seems probable, that this is the St. Colman, surnamed Mucaidhe of Ard-bo, or Arboe, the son of Aid, son to Amalgad, son of Muredach, son to Carthenn, son of Erc, son to Ethac or Eochod, son of Colla Huasius, King of Ireland. This genealogy—if relied on—should place his period in the sixth century. His memory is barely recorded in our Martyrologies, most of which assign his festival to this day ; whilst the Martyrologies of Tallagh and Maguire commemorate him, on the 21st of February. The very great number of saints, bearing this name and to be found in Irish Calenders, often leaves us in doubt regarding the particular St. Colman, who might be mentioned, in various lives of Irish Saints. At Ard-bo or Harbonensis—as the place is sometimes found Latinized—there was formerly a splendid monastery. There, too, were the relics of St. Colman preserved. In the year 1166, however, a fire broke out, and ruined the place. In the seventeenth century, only a few vestiges of its former celebrity remained. These were the remains of the old church walls, with a cross in good preservation, about fifteen feet in height. On it were several inscriptions. The festival of St. Colman is recorded at the 18th of February, in the "Feilire" of St. Oengus. We find entered, in the Martyrology of Tallagh, at the 18th of February, a festival in honour of Colman. This Calendar appends the following words to the notice : " About Meuriab near Mona (bog) to the north there lies Colman." This, however, hardly helps us to the exact identification of his place. Colman is venerated on this day, as we read in the Martyrology of Donegal. The Scottish writers, and some foreigners misled by them, have, however, confounded this saint and his festival, with the cultus of another St. Colman. He too was an Irishman, and much more celebrated than the present holy man. Thus, the Bollandists have, at this date, several dissertations, and an epitomized Life of St. Colman, Bishop of Lindisfarne, taken from the Aberdeen Breviary. It is contained in the Pars Hyemalis. In like manner, Bishop Forbes has entered some notices of St. Colman, who is so much celebrated, in connexion with Scotland. Thus, too, St. Colman, that Bishop and Confessor, who so tenaciously clung to the Scottish traditions, in reference to the celebration of Easter, has a festival assigned to him, at this date, by Camerarius... Again, it is said, that at the xii. of the March Kalends, which accords with the 18th of February, St. Colman, Bishop and Confessor, had been venerated in Scotia. The sanctity of his life, the uprightness of his moral character, and the merits of his virtues, afforded example for the imitation of his actions by a faithful flock. He was buried, we are told, at Terbert, in the diocese of Ross. The Kalendar of Drummond and of the Aberdeen Breviary has a feast for Colman, Bishop and Confessor, at xii. of the March Kalends. He had an office of nine lessons. A Scottish Kalendar, likewise, notes him. But, the leading facts of his life are, that St. Colman left Northumberland, A.D. 664, then he went to Ireland, in 667 and he died, on the 8th of August, A.D. 674, according to the Irish Annals. Camerarius, once more, places his day at March the 7th. Again, the Kalendar of Arbuthnott enters the festival of St. Colman, Bishop and Confessor, at the xii. Kalends of March. He had an office of nine lessons, as we are informed. This has been reproduced in the pages of the Bollandists. In Adam King's Kalendar, at the 18th of February, we find entered a feast to St. Colman, successor to St. Finnane, and Confessor in Scotland. Dempster notes St. Colman, Confessor, in Scotia, at this date. At the 8th of August, we shall treat about the particulars of his history. And water of earthy clay. A very ancient vellum book . . states that Fiontain of Cluain-eidhniach, chief of the monks of Erin, in his manners and life resembled Benedictus, head of the monks of Europe. Colgan styles him "Fintanus Stationarius de magno Cluaineadnach;" the epithet of stationarius being applied to him from his praying, like many others of our early saints, with his arms extended in the form of a cross. St. Fintan received his early education from a holy priest by whom he was baptized. Whilst yet a boy, he was visited by St. Columbkille, who, on that occasion, foretold St. Fintan's future distinguished career. When he arrived at man's estate, he entered the Monastery of Tir-da-glass (now Terryglass, Co. Tipperary), where St. Columba, son of Crimthain then presided over a famous school. Having passed a novitiate here, he and two, some say three, companions, being anxious to find a retired place where they might devote themselves to the service of God, consulted St. Columba, and, accompanied by him, they came to Clonenagh. Here, it is said, St. Fintan and his companions passed a year, but, finding their solitude greatly broken in upon, they determined to abandon the place, and directed their course to the Slieve Bloom mountains, again accompanied by St. Columba; this saint, looking back upon Clonenagh, saw a multitude of angels hovering over it. His disciples seeing him sorrowful, asked the cause; the saint replied: "Because I see the place we have left filled with the angels of God, and these angels unceasingly minister between it and heaven". "One of us", he added, "should return and abide there for the future". Whereupon Fintan said: "Whomsoever, O Father, you direct to return, he will instantly obey". Columba replied: "Go you in peace to that spot, O holy youth, and the Lord be with you. It has been divinely revealed that for you it shall be the place of your resurrection." St. Fintan accordingly retraced his steps to Clonenagh and established himself there; this was about the year 548. Great numbers flocked to this place to serve God under the guidance of our saint, amongst whom was St. Comgall, afterwards the founder of the famous Monastery of Bangor, who passed some years under his direction. The discipline observed at Clonenagh was very rigorous; the fasting and abstinence were so severe that St. Canice of Aghaboe and other holy men remonstrated with St. Fintan on the subject. Yielding to their representations, he relaxed the rigour of his rule in favour of his community, but, himself, adhered to his former mode of life. Finding his end approaching, St. Fintan assembled his monks and named Fintan Maeldubh as his successor. Rev M Comerford" Collections relating to the Dioceses of Kildare and Leighlin" Vol.3, (1886). 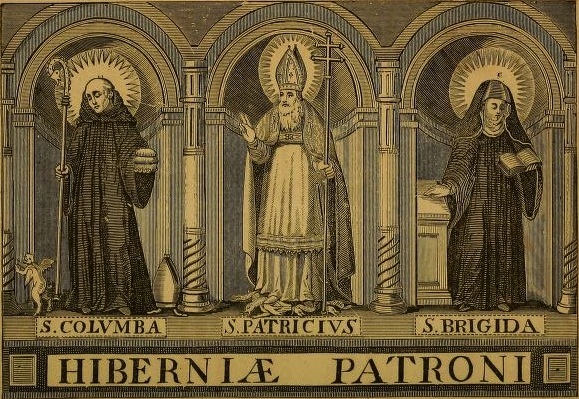 IT has been truly remarked, that the names of many Irish saints and scholars are enshrined in the records of foreign nations, when they are forgotten, or but faintly remembered, in their own country. Such was the case, with regard to the present zealous missionary, and holy martyr, who is not even recorded in the pages of our native Calendarists, although noted in foreign Martyrologies. It must be observed, that Albert Crantzius was one of the first writers, who has left us any authentic particulars, regarding this saint. From his history, most subsequent writers derived their notices of St. Tanco. At the 16th of February, Colgan and the Bollandists give short Acts for this saint, such as they had been enabled to collect, especially from Krantz, and from various other authorities. The ancient territory of Lower Saxony had been intersected by the river, formerly called Visurgis, now known as the Weser, which passes through Bremen, and falls into the North Sea. Westward of this river, the country was denominated Westphalia, and eastward, it was known as Eastphalia. In the former division, Charlemagne had founded the episcopal see of Verden. Suitbert and Patto, both of whom came from Ireland, were its two first bishops and St. Tanco is classed as the third. He is called a Scot, which designation most usually signifies, that the place of nativity must have been Ireland, when not expressly stated, that any person, thus indicated, had been a Scot from Scotia Minor, or from Albania, now known as Scotland. Colgan was of opinion, that this saint and his other colleagues, who preached the faith in Saxony, were Irish Scots, by birth. However, in what part of Ireland, St. Tanco was born, is unknown ; but, he is said to have been of noble birth. Moved by missionary zeal, like many others of his countrymen, he left the island of his birth, to spread the Christian faith amongst strangers. He travelled to Saxony. There is said to have been another Tanco, a monk of St. Gall, who must be distinguished from the present holy martyr. St. Patto had vacated the office of abbot, over a monastery, named Amarbaric, near Verden. This establishment, founded for the use of Scottish or Irish monks, is mistaken by Colgan, for the Irish Armagh, on account of a supposed similarity between these names ; he thinking, that Amarbaricensis was intended for Armachanensis. As he found no other monastery, having the former name, in either Ireland or Scotland, where he supposed it must be situated, he thus conjectured, this latter famous primatial city might have been meant. The pious Tanchon succeeded this saint, as Abbot of Amarbaric, and on Patto's death, he likewise became Bishop of Verden. This is referred to the year 760, or thereabouts, by Arnold Wion. However, this appears too early a date, as it precedes even the erection of Verden into an episcopal see, according to the most authentic accounts. Tanco, who is also called Tatta, served God many years in Amarbarica Abbey, in great reputation for his singular learning and piety. He was raised, it is said, to the dignity of abbot. Through an ardent thirst after martyrdom, he resigned this charge. The holy missioner Tanchon was animated with a hope of shedding his blood for the sake of his Divine Master. Being desirous of reclaiming the morals of the Saxon people, he fearlessly applied himself towards this task and, he is said, by the writer already named, to have received a crown of martyrdom at their hands. He ascended gloriously to Heaven, on the xiv. day of the Kalends of March, or the 16th of February, about the year of our Lord 800. Arnold Wion and the English Martyrology state, that our saint suffered about this time. The latter authority says, that after being appointed Abbot of Amarbaric, St. Tancho, feeling a desire to effect the salvation of souls in neighbouring provinces, went first to Flanders, and afterwards to Cleves,(now the chief city of that duchy near the Rhine in Germany), where he was created Bishop of Verden. However, Colgan shows, that he was not pastor over the church so called, in the Duchy of Cleeves, near the Rhine ; but, rather, at the Aller, which flows into the Weser. The Jesuit Father, Henry Fitzsimon, on the authority of the English Martyrology, records St. Tancon, a bishop and martyr, on his list of Irish Saints. An anonymous Calendar of Irish Saints has his festival at the 16th of February. Camerarius has the 16th of this month. Ferrarius, Wion, Menard and the English Martyrology, all are agreed. Again, some writers refer the date for his martyrdom, to A.D. 815 and to 820. The exact place, in which his victorious crown was obtained, is not known ; but, writers are agreed in stating, that on this day, his memory is venerated at Verden, in Saxony. There his remains are now said to repose... His dalmatic was long preserved, as a precious relic, in the church of Verden. Tanco is said to have been a holy man, a diligent observer of ecclesiastical decorum; a man who left a great reputation behind him for learning, but a still greater for sanctity. 15. D. QUINTO DECIMO KAL. MARTII. 15. BERACH, Abbot, of Cluain Coirpthe in Connachta. He was of the race of Dobhtha, who is of the posterity of Brian, son of Eochaidh Muighmhedhoin ; and Fionmaith, sister of Cruimhther Fraech of Cluain Conmaicne, in Muinter-Eolais, was his mother. When he was a disciple to Bishop Daigh, son of Cairell, Daigh sent him to a certain mill in Magh Muirtheimhne with a sack of wheat to grind it, and he found a woman and a boy of the people of the territory before him at the mill, they having with them a sack of oats to grind it; and Berach asked of them their turn of the mill, but they did not give it to him, and they put together the oats and the wheat into the mill, and a division was made between them in the mill through the miracles of God and of Berach, so that the wheat was on one side and the oats on the other side without the admixture of the meal of the one with that of the other, as is evident in his life, in which many miracles and signs are read of. The Life of Saint Berach records that after this miracle, Bishop Daigh felt that his pupil should move on to greater things and sent him to Saint Kevin at Glendalough. He first though equipped the young Berach with his famous relics - first, the Clog-Beraigh or the bell of Berach and secondly, his staff or bachull called the bachull-ghear, the 'short staff'. He spent seven years at Glendalough at the end of which Saint Kevin took Saint Berach to Bishop Etchen for ordination. Afterwards Saint Berach had a vision that he was to leave the monastery of Saint Kevin and follow a deer which would lead him to the site where he was to found his own hermitage. The site has been claimed as both Disert Beraigh, or Berach's Desert, now Dubberaith, in Bregia, East Meath and as Kilbarrach, "the church of Berach" in County Roscommon. His Life also records that Saint Berach ministered in Scotland. The simple entry, Berach, Cluana Cairpthi, occurs, in the Martyrology of Tallagh at the 15th of February. We are told, that St. Oengus styles him " the tutelary Berach." The Calendar of Cashel, and Marianus O'Gorman call him Berach, of Cluain Coirpthe, in Connaught, and they give his genealogy in full. This saint is also called Beri, and he is regarded as a bishop, in a more modern insertion of his feast, which was celebrated with an office of nine lessons. This we find, in that Calendar, prefixed to the ancient Martyrology of the Cathedral Church of the Holy Trinity, Dublin at the XV. of the Kalends of March. All notice of him, however, is omitted from that Martyrology. Cathal Maguire has not forgotten to state his family descent, and to characterize his place Cluain-coirpthe, as being in the desert of Cinel-Dobtha, in Connaught. He was also venerated in other countries besides Ireland. In the Kalendar of Drummond, at the 15th of February, in Hibernia, the festival of St. Beraig, confessor, is noted. On the 15th of February is registered, in the Martyrology of Donegal, Berach, Abbot, of Cluain Coirpthe, in Connaught. In the table, postfixed to this Calendar, his name is Latinized, Barrachias. 14. C. SEXTO DECIMO KAL. MARTII. 14. Due to the lack of further information and the existence of a number of saints with the name of Manchan, some confusion has arisen as to the exact identity of the saint associated with Mohill. The 16th-century Archbishop Ussher claimed to have a Life of this Saint Manchan written by Richard Fitz-Ralph, Archbishop of Armagh (1347-60). In it Saint Manchan was presented as having charge of seven churches and as having been the founder of the monastery of Canons Regular of Saint Augustine at Mohill. He was said to have converted many people in different localities to Christ. However, as the order of Canons Regular were a product of the 12th-century reform of the Irish Church, Fitz-Ralph is reflecting the realities of the later medieval period, rather than that of a supposedly 7th-century Saint Manchan. O'Hanlon records in a footnote that when John O'Donovan attempted to trace Ussher's copy of the Fitz-Ralph Life, it could not be found. Ussher himself seems to have concluded that Saint Manchan of Mohill was identical with Manchan of Menodroichit, whose feastday is commemorated on 2nd January and whose death is recorded in the Annals of Ulster at 652. Colgan, however, did not share this opinion, as he was unable to prove that Manchan of Mohill, County Leitrim had also been abbot of Menodroichit, County Laois. He remained convinced that Saint Manchan of Mohill was a separate individual and that the references to 'his companions' in the calendars were to the seven churches that he had responsibility for. AD 1166: The shrine of Manchan, of Maethail, was covered by Ruaidhri Ua Conchobhair, and an embroidering of gold was carried over it by him, in as good a style as a relic was ever covered in Ireland. O'Hanlon wondered if this was a reference to the famous shrine of Lemanaghan, although again he could not explain the link to two different localities and to two separate feastdays, if Manchan of Mohill is the same person as Manchan of Lemanaghan. 538AD: Manchan Maethla cecídit Manchan of Mohill dies. and finally, O'Hanlon records that 'At Inisnag, diocese of Ossory, St. Manchan, whose feast occurs on the 14th of February, was venerated as a patron'. 13. In a little boat, from the east, over the pure-coloured sea, my Domnoc brought vigorous cry! the gifted race of Ireland's bees. 13. B. IDIBUS FEBRUARII. 13. MODHOMHNOG, of Tioprat Fachtna, in the [south] west of Osraighe. He was of the race of Eoghan, son of Niall. 43. After that the aforesaid Modomnoc had devoted himself for a long lapse of years to the humility of obedience, his virtuous merits increasing, he sought the island of Ireland. The whole multitude of bees followed the ship which he had entered and settled with him in the ship, where he had sat down, on the ship's prow. For as he attended on the bees' quarters, he paid heed with the rest of the work of the brotherhood to the hives in rearing the young of the swarms, whereby he might procure some luxuries of sweeter food for those in need. He, loath to defraud the fraternal community, returned, re-appearing in the presence of the holy father, and attended by the swarm of bees, which flew to their own quarters. David blessed him for his humility. Then bidding farewell to the father and brethren, and being saluted, he went away, but again the bees follow him. And it so happened that, whenever he started forth, they also followed. Again, a third time, he sailed for a while, and it happened as before. The swarms followed him, and he returned to David thrice. On the third occasion holy David dismissed Modomnoc to sail with the bees, and he blessed them, saying, " May the land to which ye hasten abound with your offspring. Never may your progeny be wanting in it. Our monastery will be deserted for ever by you. Never shall your offspring grow up in it." That this has continued till now we have learnt by experience, for we find swarms imported into the monastery of this father, but they, remaining there a little while, gradually cease. Ireland, however, wherein never could bees exist till that time, is enriched with abundance of honey. And so by the blessing of the holy father they have multiplied in the island of Ireland, since it is agreed that they could by no means exist there at first, for if you should cast Irish earth or stone in the midst of bees, they would shun it greatly, being scattered and flying away. A.W.Wade-Evans, ed. and trans., The Life of Saint David (London, 1923), 21-22. 'There is no snake there; few birds; no bee; so that if any one should scatter dust or pebbles brought from thence among the hives [in other countries] the bees would desert their combs'. 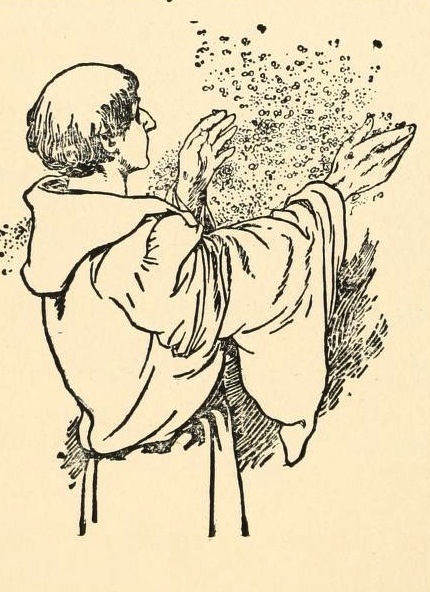 'for Bede states, in his Ecclesiastical History, lib.1, c.i, that 'the island was rich in milk and honey..' ... But that bees and honey had existed in Ireland before this Dominic was born, is evident from the irrefragable testimony of the rule of St Albeus [Ailbe] in which (No. 37) we read:- 'When they [the monks] sit down at table, let their be brought herbs or roots washed with water, in clean baskets, also apples, beer and honey from the hive, the breadth of an inch, i.e. so much of honey-combs'. quoted in John O'Donovan, 'Pre-Christian Notices of Ireland' in Ulster Journal of Archaeology, Vol. 8 (1860), 250. Wade-Evans, the translator of the Life of Saint David, speculates that the Welsh saint's dismissal of the bees may be explained by his opposition to the brewing of mead for monastic consumption. 'At Tibberaghny, his feast was chiefly celebrated, and of that place, he appears to have been the chief patron. His natalis, or departure from this life, is celebrated on the 13th day of February, according to Maguire and other writers. Another festival is kept in his honour, however, on the 18th day of May, according to the same authorities. The year of his death is not known ; but, he flourished, about the middle of the sixth century. 41.Modomnoc by name, was excavating a road with the brethren on the steep near the confines of the monastery, whereby an easier access might be made for wayfarers to convey their burdens of necessities. He said to one of those who were working, "Why dost thou work so lazily and so slowly?" The man, stirred by the spirit of anger against him who said the words, lifted up the iron which he held in his hand, to wit, a two-edged axe, and attempted to strike him on the head. The holy father, David, saw this from a distance, and raised his hand towards them, making the sign of the cross; and so the hand of him striking was withered. A.W.Wade-Evans, ed. and trans., The Life of Saint David (London, 1923), 20.